Cats, like humans, often need to eat a special diet. Often, your veterinarian will recommend a special diet for your cat if your cat is pregnant or nursing, under the age of one, older, has a medical condition or needs to lose weight. Many cat food brands offer special food for cats needing a specialized feeding program. There are also many kinds of prescription foods available through a vet’s office. If you have multiple cats and one needs a special diet, it will be necessary to find a feeding system that works. Often, you will need to separate your cats during feeding time when one is eating a special kind of food. Here are some reasons why your veterinarian might have your kitty on a special diet. 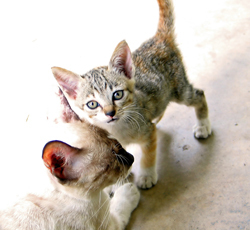 Pregnant and Nursing Cats: Cats that are pregnant or nursing will require a special diet. Pregnant females need more protein and vitamins than a cat that is not expecting. Also, cats that are pregnant or nursing will eat a much larger amount of food, especially in the final stages of pregnancy. When your pregnant cat gets larger in the last stages of pregnancy, she may not be able to eat as much at one meal. It will be necessary to provide your pregnant cat with several small meals throughout the day. When a mother cat is producing milk for her kittens, her nutritional requirements will increase. Remember that mother cats will nurse for at least six weeks and it is usually recommended that they nurse their babies for eight weeks. Veterinarians often recommend feeding a pregnant or nursing cat premium brand kitten food during this time. Kittens: Kittens grow and develop very quickly. Just like human babies, kittens need a special diet for the first year of their lives. There are many premium brand foods available for kittens. Kittens do eat more and tend to eat several smaller meals. A kitten who has not given up nursing may rely more on the food, as he or she gets older. When helping a kitten wean from the mother it is a good idea to offer solid foods as young as four weeks. Sometimes soaking the food in a little water helps the kitten chew the food easier. Older cats: As cats age, the will also have different dietary needs. An older cat uses less energy and will often need a specially formulated food. Older cats also might have more issues with their digestive system and might need special food for aiding the digestive system. There are several kinds of food just for older cats, ages seven and above. Cats with medical conditions: Cats of any age with medical conditions will probably require a special diet. These medical conditions can range from cats with diabetes, to problems with the digestive system to kidney problems. Most of the time, a cat with medical conditions will already be under a vet’s care. Your vet will recommend what type of food will work best for your cat. Cats with diabetes will require a prescription diet that is high in protein and low in carbohydrates. When you have a cat that requires special prescription food, it is important to follow the instructions given to your by your vet. Most cats will eat these kinds of food that are available in both canned and dry. When you have multiple cats, you will need to separate your cats during feeding time and take the food up when they are done eating. Overweight cats: When a cat is overweight, the easiest way to get back to a healthy weight is through a special diet and exercise. Most vets agree that cats that are overweight can suffer from other medical conditions. It will be necessary to feed your cat the diet that your vet recommends to help your cat loose the excess weight. Most cats do well with special diets. To make the transition easier, you can mix the old food with the new food. Gradually add in more of the new food until your cat is only eating the special diet food. If your vet recommends a special diet for your cat, it is important to always follow the advice to ensure that your cat is happy and healthy.